You probably all know by now that I've been feeling rather rubbish and not myself for the last few months. I've mentioned before that I suffer with arthritis, I won't bore you with the details in this post, I had surgery on my foot last year and then surgery on my shoulder in April of this year, both linked to arthritis and am thoroughly run down, fed up and miserable with it all. I've got the opportunity to try a Bimuno health supplement called Immunaid*. I have a compromised immune system right now and it could certainly do with a little help. 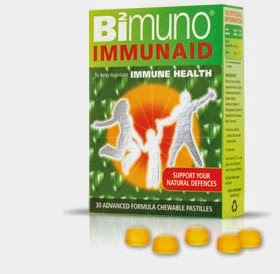 Bimuno Immunaid are chewy pastilles, taken daily to work naturally with your immune system to help support your natural defences. I know there's lots we can all do ourselves to help give our immune system a bit of a helping hand, like getting plenty of sleep (if only), eating well, exercise and keeping an eye on our stress levels but that's easier said than done with today's hectic lifestyles. I was kindly sent some for the purposes of a review so I'm going to give Immunaid a go and I'll report back to you guys on here and let you know how I get on. Bimuno offer different types of supplements so if you like to find out more click here. Have you tried any of the Bimuno range?